International collaborations are rare enough, but rarely does the world get a chance to admire the creative output of two such overbearing characters as M-Phazes (Australia) and Emilio Rojas (US). Together they are Phaze One, a throwback to the days of hip hop group collaborations that produced a single pioneering sound; a collaborative effort that follows in the footsteps of DangerDoom, Jaylib and the masterful relationship of the Foreign Exchange. After two years of prophetically crafting their imminent self-titled release, in 2011 the stage was finally set for the two artists to throw back the curtain and reveal the fruits of their labour. Both have enjoyed considerable solo success; M-Phazes is a musical phenomenon in his own right, with a definitive signature style that has seen his production on albums alongside Pharoahe Monch, Talib Kweli, M.O.P, Grammy Award Winner Amerie and a plethora of acclaimed musical pioneers. Emilio himself is no stranger to the golden aura of success; having been described by DJ Green Lantern as one of America’s most anticipated up and coming artists, he’s released a string of successful mixtape’s that have drawn the considerable talents of Grammy winners and platinum musicians. His latest work is a testament to aspiring artists, and his diligent work ethic has seen him collaborate with Shady Records signee Yelawolf, chart climbing sensation B.o.B, as well as Styles P, Nottz, Killer Mike and a whole stable of influential musicians. 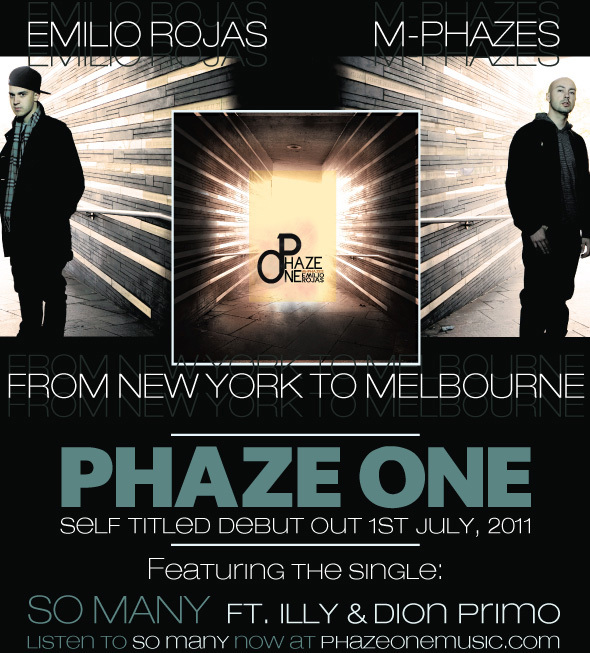 To put it bluntly, Phaze One isn’t an Emilio Rojas or M-Phazes release featuring the talents of their other half, it is a true collaborative effort where both artists are in tune to the rhythm of each other’s well timed and well placed steps. Listen to the first single So Many feat. Illy & Dion Primo below.